Drew Mortgage Associates has just added an updated mortgage loan to its services - a Home Equity Line of credit, or HELOC. This HELOC offers up to 95% maximum loan to value. Shrewsbury, United States - February 27, 2017 /MarketersMedia/ — Drew Mortgage Associates recently updated its portfolio of mortgage loan products to include a stand-alone Home Equity Line of Credit (HELOC). Drew Mortgage’s new offer seeks to help home owners with family budgets and variable levels of income. By combining multiple bills and mortgage payments, Drew Mortgage aims to create one convenient loan that meets a family’s needs. The new HELOC is designed to help families seeking financial assistance with debt consolidation, college tuition, and home improvements. Drew Mortgage understands the risks and benefits associated with taking out a home mortgage or a refinance. Its experts recommend that home owners avoid quickly committing to a loan without first consulting its mortgage loan experts. Research is necessary for such an important financial decision. Drew Mortgage’s experienced team of loan officers, realtors, and underwriters offers complimentary, no-obligation consultations. The last thing that a hopeful home owner wants to experience is facing rejection after a mortgage loan application. To help home owners and home buyers, Drew Mortgage has compiled a list of recommendations for increasing the chances of loan application acceptance. This list identifies what types of behaviors may adversely affect a potential home loan application. First, loan applicants should always be aware of their credit score. There are many services like Equifax and Experian available to loan applicants for this purpose. Many credit card services offer credit scores for free to card holders, as well. Once applicants receive their credit score, they can use this information to track improvements to their credit history. 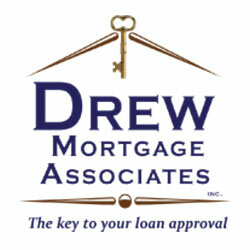 Drew Mortgage can recommend pointers that may help applicants improve their credit scores. For example, simple actions such as catching up on past due payments, paying more than the minimum due on a credit card bill, and paying down current debt can increase credit scores in as soon as one month. However, these results are not always immediate or guaranteed. Second, Drew Mortgage highly recommends setting aside a fund for a down payment on a new home loan. Mortgage loans and refinancing options often don’t provide 100% financing, making the down payment a critical first step in the loan process. Even though Drew Mortgage’s new HELOC finances up to 95% of the maximum loan to value, the loan applicant will still be responsible for providing a down payment. In most cases, a higher down payment at the beginning of a loan’s life span can decrease both interest and principal balance in the long term. In addition to a HELOC product, a down payment savings fund serves as an extremely beneficial way to save money on a mortgage loan. Third, a significant factor in a successful loan application is proof of income. This includes legal documents that can verify stable income, such as a W-2 or employment paystub. The reason for a proof of income request is to demonstrate a borrower’s ability to afford and repay the loan. The “ability to repay” is a critical factor in loan approval. Furthermore, loan officers will generally provide additional details regarding acceptable documents for this purpose. Applicants who are unemployed or under-employed will commonly find it more difficult to secure a successfully approved loan. The final and most important factor in loan approval is actually the lender. Not all lenders have the same standards for loan approval. Furthermore, not all lenders offer the same level of commitment, integrity, and dedication in helping home owners and home buyers find a mortgage loan or refinancing program that works for them. Drew Mortgage’s latest HELOC product was developed to help qualified borrowers seeking to tap into their home equity. The mortgage professionals at Drew Mortgage will take every reasonable step to help clients qualify for the new HELOC, expedite paperwork, and close the loan. For more information on Drew Mortgage’s HELOC and financial services, please visit www.drewmortgage.com or call 1-877-949-3739. Organization: Drew Mortgage Associates, Inc.